It’s time for a sibling reunion! Join us for Siblings Day, a wonderful campus tradition for UC San Diego undergraduate students and their young siblings. 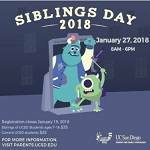 Registration closes January 19, visit http://parents.ucsd.edu/events/siblings-day/index.html.